Place the broth, juice and bread in a blender. Cover and blend until the mixture forms a paste. Pour into a large bowl. Stir the tomatoes, cucumber, cantaloupe, vinegar and basil in the bowl and season to taste. Place 1/2 of the broth mixture into a blender. Cover and pulse about 5 times for a partially blended mixture. Pour the mixture into a medium bowl. Repeat the blending process with the remaining broth mixture. Stir into the puréed mixture. Cover and refrigerate for 3 hours or until the soup is cold. Ladle 1 cup of the gazpacho into each of 6 chilled serving bowls. 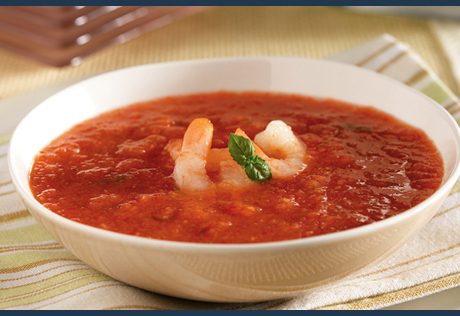 Top each serving of soup with about 2 shrimp and additional basil for garnish, if desired. This soup may also be served hot. Pour all of the puréed mixture into a 2-quart saucepan. Cook over medium heat until the mixture is hot and bubbling.